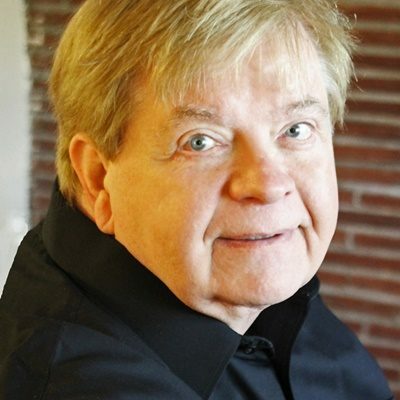 KC Melting Pot Theatre focuses on local talent in plays written by local playwrights, and Harvey Williams’ “On Shoulders Now” goes one step further by setting the story in Kansas City. “On Shoulders Now” creates a story specifically for the Christmas season with a story-line that aligns with the birth story of Jesus, but with modern twists and without immaculate conception. The values set fourth in Williams’ play reflect kindness and belief in the humanity. 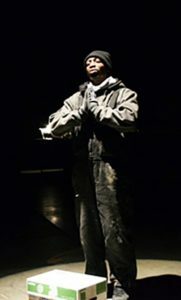 The play opens with a ghost telling the audience of his recent passing and the best Christmas he experienced just prior to his passing. Vernon sets the stage for the story that follows. 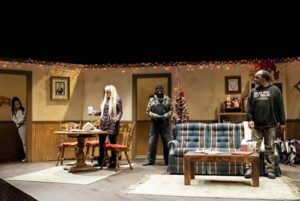 The play concerns an expectant couple evicted from their apartment on Christmas Eve during a brutal cold snap. The young woman, very pregnant, could deliver at any time. Two strangers cannot allow the couple to remain homeless and in the elements on Christmas Eve. To help, the two men bring the couple to a house where three women live and they, themselves sometimes stay and monitor. As the play progresses, the audience learns that the women have been on the streets for various reasons and do not appreciate their Christmas Eve and house used as a hotel for the unknown couple. As the women learn more and more about the evicted couple, the charity of the human heart combines with the Christmas spirit. The reason for the season trumps all doubt as the women learn the circumstances that brought the couple to their doorstep. 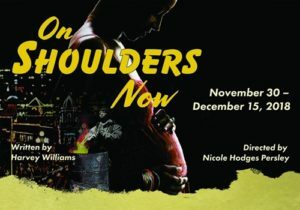 “On Shoulders Now” ushers in the holiday season with family themes and the spirit of good will toward others. 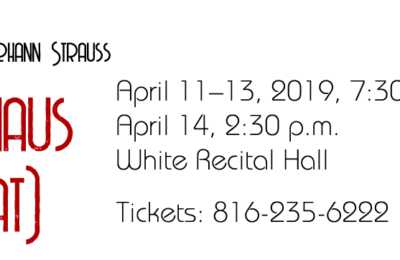 The play reminds viewers that the poor and unfortunate do not always create their situations or the circumstances that led there. The show encourages kindness and understanding. 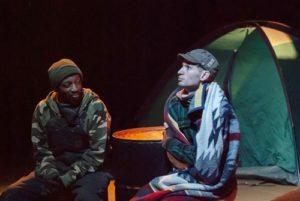 Williams tested the play a few years ago, with some of the current cast, but turned over directorial duties to Nicole Hodges Persley who filled some spots with some different talent. The result, fantastic. The entire cast performs well as an ensemble. There is not a weak performance in the play. The direction is crisp and the dialogue very realistic. The actors lose themselves in the roles. Williams created characters that have authenticity and a reason for their inclusion in this play. Very strong performances come from Desmond Jones and Theodore Hughes. Their characters smack with reality as people you know and see every day. The play also welcomed Regina Sanchez in her debut performance as Carmen. The cast is: Desmond Jones asVernon, Theodore Hughes as Eddie, Cydia White as Noi, John Van Winkle as Levon, Elizabeth A. Hillman as Lacy, Jabrelle Herbin as Shanel, Regina Sanchez as Carmen. The creative team is: Nicole Hodges Persley, director; Timmia Hearn, stage manager; Robert Crone, scenic design and co-set builder; Danny Kopitke, co-set builder; Therese Kelly, lighting designer; Nick Hazel, assistant stage manager; Marica Davis, costumer; Dasheen Phillips, board operator; Melonnie Walker, dramaturg; Jeremy McKinnies and Timmia Hearn, sound design. 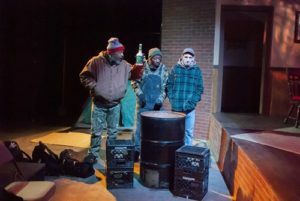 “On Shoulders Now” continues at the Just Off Broadway Theatre through Dec. 16. 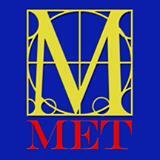 Tickets can be purchased through the Just Off Broadway Theatre website.